We have all been there before. You’ve dieted hard and you’ve done tons of cardiovascular activity but you step on the scales and nothing has changed. You reach the conclusion that you just can’t get in shape, that you simply can’t lose weight on a low calorie diet with regular exercise. Today you’ll find out why this happens and how to sort it out. The general rule for those looking to drop some pounds, of course, is to eat less calories and exercise more. However, there are thousands upon thousands of people out there who are doing too much of one thing and not enough of the other. In rare instances, you even find people who are doing too much of both things. If you can\’t lose weight on a low calorie diet today\’s video will teach you the facts. If your goal is to get a smaller waist and retain it, you need to avoid the common trend of coupling starvation diet tactics with a near gym addiction. Otherwise you’ll find it very difficult to forge further progress and get frustrated to see others obtaining results while you stay in the same position. This trend is so popular because it is often pushed by gossip magazines and experts who proclaim that there is an instant solution to your problems, while making you believe that all of your favourite foods are you enemy. An initial drop in weight is seen due to the sheer shock placed on the body as it struggles to comprehend with this new routine. The person fools themselves into believing this drop must mean it’s working, before hitting a sticking point a couple of weeks later. About one month into it, they reach a stage where they feel like they cannot lose anything no matter how hard they work or how little they eat. As a result of this sticking point, they begin eating even less and exercising even more. The depression takes hold and forces them to come off the rails, binge eating on junk foods and takeaway meals. Their body cannot handle this sudden influx of calories after a starvation diet and suddenly piles a lot of weight on in reaction to it. You may wonder how on earth the body can not lose any unwanted pounds despite barely eating and working out all the time, but the answer is very simple. The metabolism is slowed by the body in reaction to the starvation diet and extra high workload being placed on it by the individual. The body is concerned that it is being starved, therefore it refuses to let you burn off any of it’s valuable fat stores because it needs them to keep you alive. If you are pushing yourself hard in the gym you will begin to shed lean muscle tissue, too. That’s certainly not a situation you want to find yourself in, but sadly many people do. These are now signs associated widely with crash, quick fix and yo-yo diets. Instead of adopting this unsuccessful approach, incorporate HIIT into your routine and use it alongside a regular weights-based program. That’s right – building lean muscle tissue via weight training will actually increase your fat loss substantially! When trying to structure the perfect diet, the first rule is the eliminate any thoughts of starving yourself or cutting out certain nutrients like carbohydrates. If you are reading this and perhaps noticing that you may have put your own body through this in the past, the best way to get back on track is to slowly increase your calories each week rather than suddenly jumping up. Who do you think will find it easier to lose body fat – the person eating 500 calories per day or the person eating 2000 per day? Obviously, the latter. They have more calories to play with and therefore will find results a lot easier to come by. You should never, ever be eating less than 1000 calories per day if you are regularly exercising. If you walk into any fitness suite you will hear countless men and women saying that they can’t lose weight on a low calorie diet and wondering what they need to do to sort it out. Rather than running straight to the first personal trainer you see, simply look at your eating habits and exercise routine. You will usually find that the issue is right under your nose. About your author: Top online personal trainer Russ Howe PTI shows proven weight loss tips on his website every day. 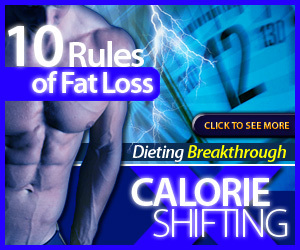 If you feel like you can’t lose weight on a low calorie diet he will show you how to correct this issue.